What do the Beatles, Jimi Hendrix, Elvis Presley, Eric Clapton, Bob Dylan and Irving Berlin all have in common? Despite their international composing and performing careers, none of them could read music! And lute players and guitarists from Elizabethan times to the present day have all followed tablature rather than notes. So, do Ocarina players need to read music? The choice is yours! Ocarina tablature is amazing. Oc-Pix™ and Oc-Box™ allow children and adults with no previous musical experience to play tunes fluently. They also promote reading-readiness in the young. Dyslexia experts note how clearly this specific Ocarina tablature works in directing fingers to the correct holes. This is why all ‘Play your Ocarina’ Books show ocarina tablature alongside the music for maximum success. Whilst tablature is a great starting point, ‘reading the dots’ can help aspiring musicians become multi-instrumentalists. 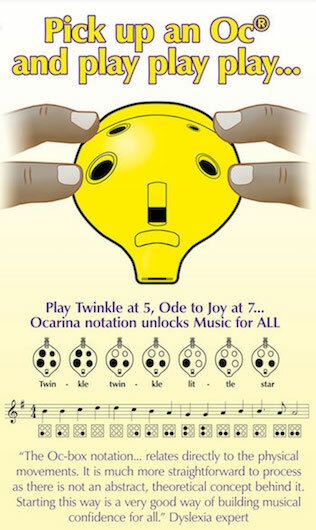 ‘1-2-3 Ocarina’ is designed specifically to introduce musical notes one-at-a-time, empowering today’s Ocarina players to become tomorrow’s violin, flute and trombone players as well. Whether you read music or not, the Ocarina is a great little instrument for playing by ear and for making up tunes. So don’t let music reading get in the way. Play, play and play again from the books, from your imagination and by jamming with friends. And always have fun! The Oc-box notation… relates directly to the physical movements. It is much more straightforward to process as there is not an abstract, theoretical concept behind it. Starting this way is a very good way of building musical confidence for all.